As fight night nears, six of the top 154-pound world champions and contenders shared their thoughts and analysis of the high stakes matchups taking place Saturday, October 14 in a SHOWTIME CHAMPIONSHIP BOXING tripleheader from Barclays Center, the home of BROOKLYN BOXING®. “Charlo vs. Lubin is really a great title fight between two tremendous fighters. Charlo is going to have his hands full with Lubin. I think Jermell is going to come out on top with a close, split-decision win. “It’s really hard for me to predict these fights. All six of us are going to leave everything in the ring to seize this opportunity. May the best man win. “Experience is going to be the key on October 14. The fighters who use their experiences to their advantage will prevail. “I really think Hurd vs. Trout is a 50-50 fight. If Trout can box for 12-rounds and not get tired the way Tony Harrison did, I think he’ll win the fight. But if he slows down in the later rounds, I think Hurd will probably take over and stop him. “Gausha is going to have to keep a high pace and stay in Lara’s face all night, because you know that Lara is going to use the ring. In the end I think Lara is just on a different level than what Gausha has faced. I think Lara will win by decision. “This is really a great night of guys putting it all on the line in tough fights. I’m expecting these to be hard-fought and close bouts. You really can’t know who the winner is until the fight starts, so I think it’ll be exciting for the fans. 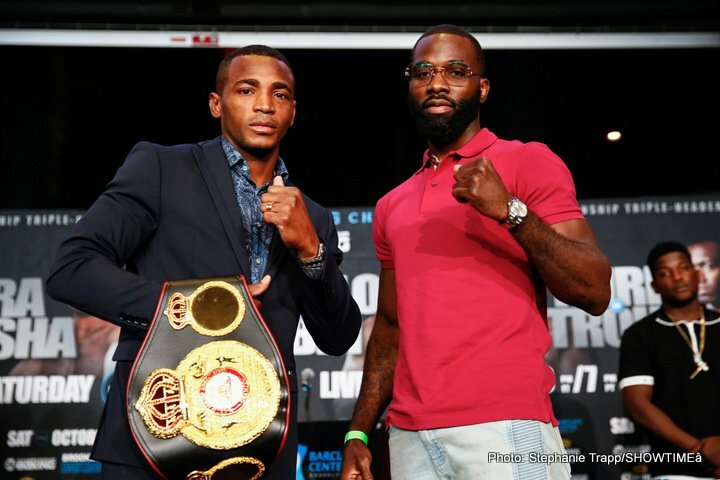 The Premier Boxing Champions event is headlined by Erislandy “The American Dream” Lara defending against undefeated Terrell Gausha in the main event of SHOWTIME CHAMPIONSHIP BOXING. Coverage on SHOWTIME begins live at 10 p.m. ET/7 p.m. PT and features hard-hitting unbeaten champion Jermell “Iron Man” Charlo taking on top contender Erickson “Hammer” Lubin and “Swift” Jarrett Hurd making his first title defense against tough former world champion Austin “No Doubt” Trout.